1- Don't miss the early season! You have been picking cherries all summer in Western Canada and became addicted to it ? You just arrived as a backpacker in New Zealand on a working holiday visa and you are farms for the adventurous pickers.already planning on going fruit picking because your bank account is running low ? Or you are a professionnal fruit picker looking for a way to optimize your cherry season in New Zealand? Here is a post for you. Even if New Zealand is a small player of the world cherry production (the southern hemisphere is only representing 7% of the world production and Chile is harvesting most of it), they do grow sweet cherries and have gained a really good reputation regarding the quality of their production, allowing them to access several juicy export markets (including Hong Kong, Taiwan, China and Japan). It means that they need good quality pickers and that usually, they are ready to pay them fairly for their work (from what I have seen in New zealand , cherry picking is almost exclusively paid on piecework). In New Zealand, an experienced cherry picker should easily average 180-200$ per day, but it will require hard work, being able to be at the right spot at the right time and, above all, to be well-organized. So let’s explain more precisely how to plan your season and book your picking jobs in advance. Don’t miss the early season! Even compared to Australia, New Zealand is a small cherry producer with only one major production area : Central Otago. There are some early orchards in the North Island around Hastings, and in the South Island around Blenheim, but they are quite small and all together, they represent only a few picking jobs : that’s why it’s so important to contact them 2 or 3 month in advance to book one! As the cherry production in New Zealand is focusing essentially on export premium quality, most of the farms are asking for single and colour picking, and even sometimes for size picking. 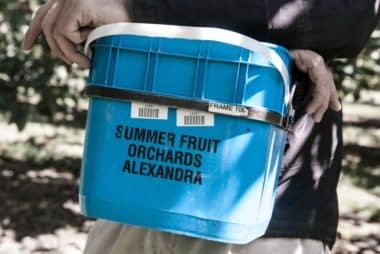 If you are used to canadian bunch picking, where you basically throw everything but buds and leaves in your bucket, you’re better to train yourself to select picking if you want to last more than a couple of days in a New Zealand cherry orchard. 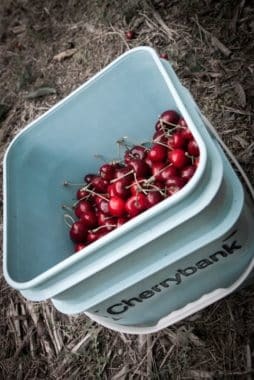 The good counterpart is a pretty high price (up to 1,20$ per kg), loaded trees, and quite big cherries The New Zealand wide picking container for cherries is a 5 kg plastic bucket (see pictures below), which is usually paid between 5 and 8 dollars. Geographic areas : Hawke’s Bay and Marlborough. travel from overseas just for the cherries. Of course, you will have more chances of getting the job if you have previous experience, especially if you’ve done single picking before. So don’t hesitate to mention the orchards you’ve worked for previously. Even if it was in Australia or Canada, they might know them. 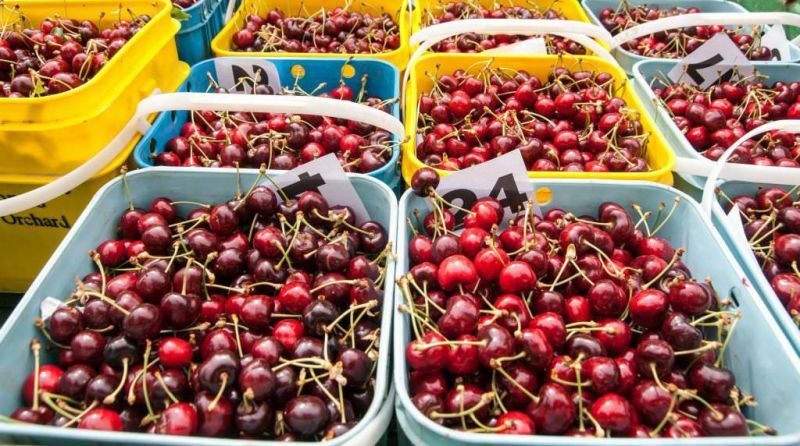 Here are some of the orchards you should try : Hasting (Hawke’s Bay) : Omahuri Orchards; Blenheim (Marlborough) : Cherryland, Cherrybank, Scalloway Cherries, South Pacific Cherries Limited. Geographic areas : Central Otago. The Central Otago is the driest area of New Zealand and ressembles the Okanagan Valley in Canada (for the ones who have ever been there). Summer are really hot and winter quite chill, which makes it, as water supply is available in summer, a prime cherry growing region. For this reason, Central Otago counts for more than 80 % of the total New Zealand cherry production and some of the farms are pretty big (up to 200 hundred pickers for some of them). A nice bunch of premium quality cherries from Central Otago. There are three main towns where cherries are widely grown : Cromwell, Alexandra and Roxburgh (from north to south). They all start picking around mid-December and most of them will be over by mid-January. The ones which keep going till early February are the ones which planted a lot of the last varieties to fruit : Sweetheart and Staccato. Fortune Fruit is one of them and is famous among professional pickers, as it’s one of the only cherry farm in New Zealand to accept bunch picking. 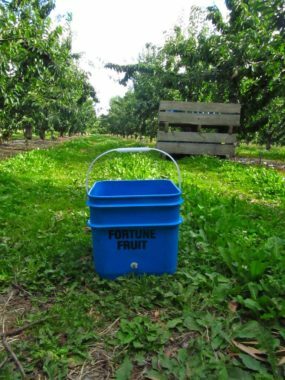 The price is naturally lower (3 $ per 5kg bucket), but you can pick a lot faster (in a good season, the best pickers would reach 200 buckets on their best days). They have about 35 pickers per season but the places are highly prized, so start to think about booking a spot as soon as April or May. 45 South Cherries, Central Cherries Limited, Summerfruit Orchards, NS and EN Hinton, Leaning Rock Cherries and Gourmet Sumerfruit are some other major actors of the cherry industry in the area and together, represents over 600 cherry picking jobs. So consult their profile and feedback and make your choice. Geographic areas : different parts of South Island. The presentation of the cherry picking opportunities in New Zealand wouldn’t be complete without evoking some of the cherry farms which are far away from the main production centres. They are worth mentionning in the way they could provide picking jobs to some more adventurous pickers. Motueka: In the heart of the apple production centre of South Island, are nesting some lonely cherry blocks. If you drive by in December, stop and have a look, they might be looking for pickers : Thomas Bros and Cherry Farm in Motueka. 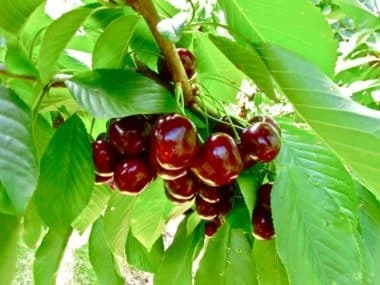 Banks Peninsula: For the ones of you who love to be close to a big city while working in a farm, here is a big cherry orchard less than 40 km from Christchurch : Kaituna Orchards. Their website just shut down but the cherry blocks are probably still there. So if you drive by in December, have a look and let us know what’s going on there ! Oamaru: For the last few years, the Oamaru area has been a laboratory for cherry tree growing and training, including some orchards only made of root restriction cherry trees (trees are grown in a container, following the japane “Bonsai” principle ; more information on this link). Most of those farms are really small and I am not even sure they would hire pickers,… but the only way to find out is to try! Here is one of them : Kowhai Cherries. You made it to the end of this post, congratulations 🙂 ! Let us know if you would like to have a post treating of one cherry growing area with more precision, it would be a pleasure for us. Also, feel free to comment this post . As it’s one of the first blog post on the website, we definitely need your feedback. 16/01/2016: Central Otago: Recent rain damage is not a big deal! 10/12/2015: Central Otago: Bumper crop twice in a row! Many thanks for this usefull post! I’ve just been hired by Cherryland for the end of november, will give you a feedback on this farm at the end of the season. You just have to log in on the website and you will be able to see contact details for every orchard. Really good post! Which company would you recommend for my very first cherry picking season? Cheers! For your first season Summerfruit in Alexandra or Cherry Corp in Cromwell could be a good choice as they hire many beginners! All cherries from Cherry Corp are sold out. 🙁 crying!!! What do you mean Hana by all “sold out”?????? I’m new beginner. I would like to work as picker end of this November – December. Any recommend? From which country are you coming from, and in which country are you looking at working? If Australia and/or New Zealand, then End of November can be a good timing for the cherry season (either picking or packing), it’s also time for apple thinning. Check on our website to find farms and contact details. Good luck. do i have any chance to get a “picking fruits” job in Australia or New Zelannd,i’m from Bosnia and Herzegovina? greetings!!!!! Hi Jovan, unfortunately there is no work visa available for citizens of Bosnia and Herzegovina for seasonal work in New Zealand. Sorry. What about people from Serbia, do we have any chance to get a job? Im a student from Kuala Lumpur, Malaysia. How do apply for the job picking cherry fruits in New Zealand. I’m planning to visit New Zealand soon. As a free community website we are not involved in recruitment. To look for a job you need to log in on our website and contact farmers yourself, as there are all the contact details for the different farms. Good luck. Hello and thanks for the very useful article ! I am from France and looking for a picking job in the north island. I think might be too late for cherries but I can still give it a try. What orchards for cherry is there in the north island except Omahuri Orchards ? Thanks a lot ! I was picking the last year cherry’s in nee Zealand and I will love to return. Do you know how to do a seasonal visa? (I used my working holiday already).